Avi-Calcium is a soluble calcium supplement for birds. This supplement is enriched with extra Vitamin D3 for optimal health. Avi-Calcium helps to improve skeletal structure, nails, beaks, feathers and supports eggshell integrity. It is also helpful for bone development in younger birds. This is mainly used for poultry birds such as chickens, turkeys, emus, fowl, quail and other similar breeds. 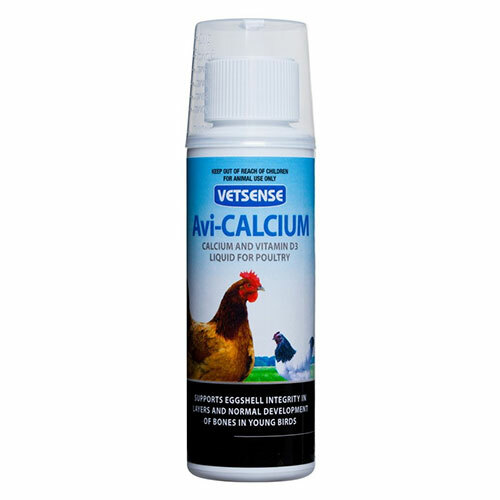 Avi-Calcium is recommended by most vets to strengthen the bone health of poultry birds. 4mL/bird with 500mL of clean drinking water per 2kg of body weight. Change the water daily and do not let the mixture sit for more than 24 hours. Each bird consumes between 250mL to 500mL of water per day depending on the age and weather condition. ​Do not add anything else to the drinking water such as antibiotics or apple cider vinegar while using this supplement. Supplies its own measuring cap for your convenience. Mix solution with water only.